This 3.4 mile loop consists of improved and natural surface trails that are open to all muscle-powered activities including mountain biking, skijoring, cross country and skate skiing, snowshoeing, equestrian use, and year-round walking and hiking. Location: Anchorage, AK, In east Anchorage, off Abbott Loop Road at east 68th Avenue. The boreal-forested summer and winter Campbell Tract Loop Trail found within BLM's Campbell Tract Special Recreation Management Area is a critical link between urban Anchorage trails and surrounding municipal and state park wildlands. This 3.4 mile loop consists of improved and natural surface trails that are open to all muscle-powered activities including mountain biking, skijoring, cross country and skate skiing, snowshoeing, equestrian use, and year-round walking and hiking. 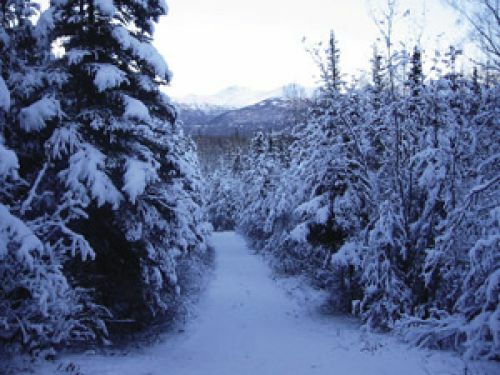 Trail users on the loop experience numerous opportunities to view Alaskan wildlife species including black and brown bear, lynx, moose, bald eagles, owls, coyotes and the occasional wolf. Use surveys documented over 90,000 trail user visits in federal fiscal year 2006, with an average annual increase of 5% over the past five years. The system is a model of stewardship through partnership, with literally thousands of volunteers investing their sweat in trail upgrades and maintenance activities during National Trails Day, National Public Lands Day and similar volunteer events over the past 5 years. Ten different partner organizations and user groups regularly provide annual trail maintenance assistance, and agreements with three of these groups insure the loop receives excellent winter grooming throughout the snow season. Every year, these Campbell Tract Trails introduces over 44,000 Anchorage School District students and others to non-motorized outdoor recreation opportunities as part of natural history programs at the BLM Campbell Creek Science Center. Fun trail to hike, close to home and convenient for just getting out of the hustle and bustle of city life and into the woods for a walk alone or with the family.